Dublin's Paul Mannion scores his side's crucial first half penalty past goalkeeper Niall Morgan. Dublin and Tyrone fans at the All Ireland final. 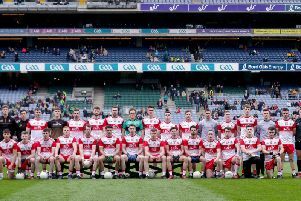 Tyrone's dream of a fourth All Ireland title under Mickey Harte were dashed by a Dublin team that recovered from a difficult start to secure to make it four successive Sam Maguires with a six point victory in Croke Park. The victory means it is an unprecedented 28 Championship games since Dublin tasted defeat last tasted defeat even if Peter Harte's late penalty gave the Red Hand fans a brief glimmer of hope as the game ticked itno seven minutes of injury time. As it was, the game hinged on five first half minutes and a controversial penalty with Tyrone leading by four points after a superb start. After Dean Rock had opened the scoring for Dublin from a free, Tyrone hit five unanswered points from Harte (free), Mark Bradley, Tiernan McCann and Conor McAliskey (2, 1f) had the travelling Tyrone fans dreaming that it might be their day. However they had already registered a number of wides and the misses came back to haunt them when Paul Mannion was adjudged to have been hauled down by Tiernan McCann with referee Conor Lane awarding the spot-kick. Up stepped Mannion to rifle a fierce shot high into the Tyrone net past Niall Morgan. With Ciaran Kilkenny having pointed seconds earlier, the champions were suddenly level in a game they had looked second best in previously and they never looked back. Two further points from Rock further drained the Tyrone spirits and while Cathal McShane offered and encouraging response, a second goal wasn't far away and arrived on 28 minutes when Con O'Callaghan brilliantly sets up Scully who palmed the ball into an unguarded net for a 2-05 to 0-06 lead that would become 2-07 to 0-06 by the interval. It was a gap Tyrone were never able to bridge despite a brave second half in which they outscored Dublin. Harte's late penalty after Philly McMahon had man-handled Colm Cavanagh in the square offered only brief hope even with Dublin down to 14 men after a second booking for John Small in injury time. Tyrone never stopped but those crucial first half goals had given Jim Gavin's teams the cushion they needed.